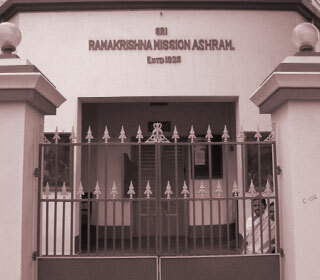 Ramakrishna Mission Ashrama, Puri was started in its present site in 1925 by a group of devotees inspired by the ideas and ideals of Sri Ramakrishna, Holy Mother Sarada Devi and Swami Vivekananda. Holy Mother Sri Sarada Devi along with some direct disciples of Sri Ramakrishna came to Puri thrice. She stayed at the properties of noted devotee Sri Balaram Bose – at Kshetrabasi Math on the first two occasions and at Shashi Niketan, a stone’s throw away from the present site of the Ashrama, during her third visit on her way back from South India. Certainly this Ashrama had the blessings of the Holy Mother Sri Sarada Devi and those direct disciples of Sri Ramakrishna. The Ashrama was formally affiliated to the Belur Math in 1944. 1956 saw the birth of a Students’ Home for scheduled caste / scheduled tribe boys. A Mobile Medical Unit was started for the rural people in 1984. The Ashrama library and reading room has been functioning since 1925 with high admiration from the public at large. Since it’s inception as well as its affiliation to Belur Math this Ashrama has been catering to the spiritual needs of the devotees and also serving the deserving people of this district. 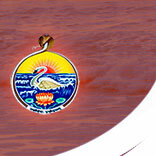 It is due to the generous support of the devotees & admirers the Ashrama has developed to its present dimension. 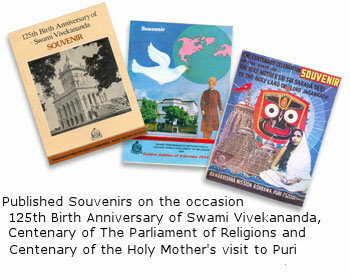 After fifty years of its affiliation to Belur Math, in 1994, Golden Jubilee of this Ashrama and Centenary of Swami Vivekananda’s participation at Chicago Parliament of Religions were celebrated through different programmes (Youth Convention, Old Students’ Reunion, Public Meeting, Quiz/Speech Competition & Rally) and a special souvenir was published in each of the occasions of 150th Birth Anniversary of Bhagavan Sri Ramakrishna, 125th Birth Anniversary of Swami Vivekananda and Centenary Celebration of the visit of Holy Mother Sri Sarada Devi to the land of Lord Jagannath. The Ashrama in its present shape is engaged in serving God in Man.